These really are the best Gluten Free Rolled Sugar Cookies I’ve ever had. They are better than the ones that I used to make before going gluten-free. That good! It’s that time of year again! Time to start thinking about what kind of goodies will adorn your holiday table. I find it hard to narrow down the number of recipes I use, and some years it ends up being 15 or 20 different types of cookies, candies, and snacks. Each year the variety changes, but there are always a few favorites that the family insists on. Gluten Free Rolled Sugar Cookies is one of those that is a “must have” every year. It’s also a great recipe to have on hand because by changing the cookie cutters, you can use this recipe year round. In the bowl of a stand mixer on medium speed, beat the softened butter and sugar until fully incorporated. Reduce the speed to low and add the extracts and the egg. Mix just until blended. In a separate mixing bowl, whisk together the salt, baking powder, rice flour, tapioca starch, potato starch, and xanthan gum. THIS is the Royal Icing recipe I used. It comes from www.sweetopia.net. Also perfect for your special Valentine. Spring/Easter Cookies are so cute too! 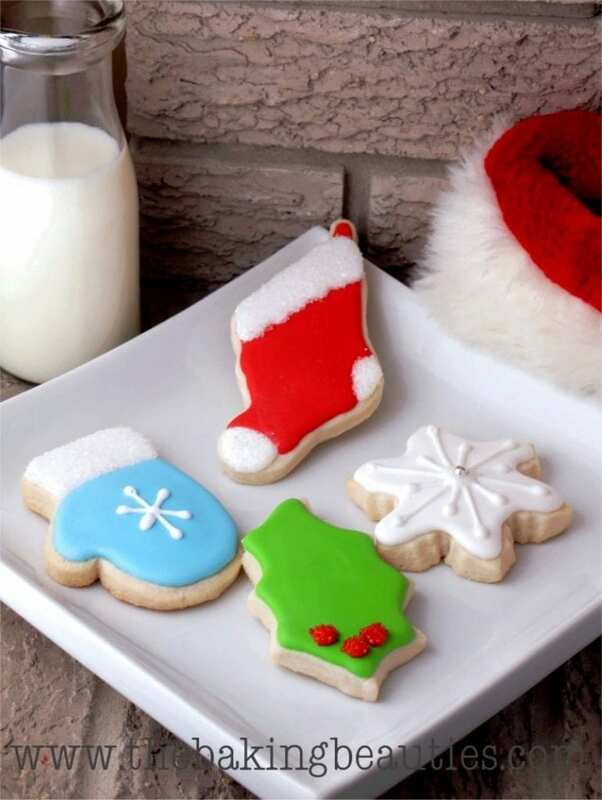 For great tips on decorating your Gluten-Free Sugar Cookies, be sure to visit Sweetopia.net. Marian has a lot of really great recipes, tutorials, and videos to walk you through your cookie decorating. I had the pleasure of meeting Marian at Canada’s Baking & Sweets Show in September. She is AMAZING at what she does! I’m so happy to have found your site. I’m new to the Gluten-free world and anxious to find recipes and ideas to help me eat gluten-free. These cookies look so pretty and I can’t wait to make them. is processed in a facility that also does wheat. Also all the sprinkles and decorations that you can add or processed in… Have you had an issue with this. My daughter is that sensitive so I list my cookie ingredients but don’t claim GF. I would love feedback on this issue. Here is the OLD FASHSION WAY to make Royal Icing without the Wilton M. Poweder. this is the same repcipe I was taught from Wille Witon (the son of the Creator of Wilton products) he taught me the OLD School way, as I live in Sweden and have can not buy frosting or cake mixes (GF or other). Awesome, Genee!! All those changes, and the last of the cookies still disappeared by morning. 🙂 Nice!! Love it when I hear how others have changed the recipe! It was such a pleasure meeting you this past fall! I can’t wait to try your recipe out and your cookies turned out so cute – love them! What could be used for the white rice flour? I understand there are is not many good nutrients in white rice. I love your blog. I was just wondering how many cookies this recipe makes? Finally got around to making these today, they are amazing!! My kids devoured the ones I let them eat. Can’t wait to frost them tomorrow. Thanks so much for another great recipe! Oh Jeanine…you have done it again! Hit it right out of the ballpark! These are amazing! I admit to substituting almond extract for the vanilla thinking I had to hide the flavor of the tapioca . I seem to taste it so easily and hate it. Passed them around the living room warm from the oven to my family: GF and normals and they got rave reviews. Any left over will get iced tomorrow. Last Christmas I suggested you try your hand at a rolled sugar cookie …don’t know if that registered with you? But at any rate you made this glutenfree mom and her daughter very happy!!! Hubbie was happy too but he has his own Martha Stewart Sugar Cookies already…and he liked these better. Hah! This year’s request (maybe I’ve missed it in your bread archive) is an artisan bread baked in a cast iron pot very hot in the oven. Have you seen recipes for this type of bread? My dad was a baker and I miss a good chewy crust. If you have a bread like that I would love to try it! I really loved these cookies. My husband has always been good about trying gluten free food because I have to eat that way, but he actually requested I make these a second time because he loved them so much. Thank you for sharing this! The only trouble I had was making the icing too thick. I’m new at royal icing. The icing is a bit finicky, but by playing around, you’ll get it. If it’s too thick, add water until you get the 10 second rule (explained on http://www.sweetopia.net), and if it ends up too runny, then add more icing sugar. enjoy!! These are the best sugar cookies I’ve ever made, glutenous or not. I’m fairly new to gluten free and there is definetely a learning curve to gf baking. I followed the recipe exactly and they came out perfect. I rolled the first half a little to thin and they baked fine, they just didn’t puff at all. The second half was thicker and they puffed a little. Thank you. Would you be able to substitute an all-purpose gluten free flour for the rice/potato/tapioca flour? Wow! I substituted arrowroot starch for potato. These are fabulous! The almond extract really adds to the flavor and the texture is wonderful! Thank you, thank you, thank you for sharing this. It’s sure to be a family favorite! We enjoyed your rolled/cut sugar cookies for Christmas. The dough was easy to work with, and the cookies are every bit as good as any Christmas sugar cookies I’ve tasted. Thank you for sharing the recipe! I made these for Christmas and a batch of wheat based roll out cookies too. My wheat eaters preferred the gluten free ones! Well done! I want to thank you for your recipes! I made your gluten free peanut butter cup cookies, white chocolate peppermint cookies, and your banana chocolate chip muffins. They all turned out great!! Thank you so much!! I made these and they were perfect!!! I used Nameste flour instead of individual flours and they were still perfect!!! Can I use brown rice flour as opposed to white rice flour? I do not have white rice flour. These look amazing!! I definitely hope you give these a try, Kara! I’ve made these numerous times, and no one can tell they are gluten-free. Be sure to refrigerate your dough before baking, and if your cookie shape is really finicky, refrigerate again after cutting but before baking. Enjoy! Ok, just took these out of the oven … One ‘accidently’ broke, so I had to eat it, right? Wow! I didn’t really like sugar cookies before I went g/f, but I love your version, as did my gluten eating husband! This recipe is definitely a ‘keeper’ and wins a place of honour on the christmas baking list. Thanks for sharing your talent and recipes with us! I’m new to GF baking due to my son’s celiac diagnosis this year. I came across this recipe for rolled sugar cookies via a google search and can’t tell you how happy I am to have found it!! These were great, even my dad thought so and he’s not one to sugar coat when he doesn’t like something…lol. Thank you for helping us keep the Christmas cookie tradition for my son!!! I’m wondering how well these stand up to handling as the kids will be wearing these around their necks? I know, from my experience, that GF tends to crumble more than regular. Any idea? Whoops! Didn’t see your comment till now! Anyway, I made these and they turned out wonderfully! I’ll try to send a pic because they’re so sweet. Love this recipe!!! The dough is wonderful to work with – I rolled it out between a Silpat sheet and some plastic wrap – didn’t require any bench flour and the dough handled so easily. I am about to turn these into Imperial Cookies – my favourite – have missed having Imperial Cookies since diagnosis 8 years ago. Much thanks for sharing the recipe and for all of your recommendations. Thank you for this recipe! I made a few changes-used a flour blend since that’s all I had and half of a juiced lemon and they are so good! Just curious about a chocolate sugar cookie … Would it ruin the texture to swap 1/3 of the white rice flour for cocoa powder? Good question, Michelle! I’ve never tired though, so I can’t say for sure. Worth an experiment though, I think. Awesome ! Third time is the charm ! I tried two other recipes that did not hold together well and tasted of honey flavored cardboard. These are light , sweet, crisp, yet soft in the center . They held together very well. I made 47 three inch stars from one batch.I baked them on silicone mats . Thank you so much , we went gluten free in May . I am the family Christmas cookie baker trying to figure out how I can keep the tradition going in my gluten free kitchen . So much to learn. Best gluten free sugar cookies!! Made different recipes but those held together and we’re the easiest to handle. people who tried them never knew they were gluten free and that is the best sign. We are also dairy and corn free. Would coconut oil or margarine be a better substitute for the butter? And are they good without being iced? I have yet to find a corn free icing sugar powder. I just wanted to share for you (and any others) that can’t find a corn free confectioners sugar for the icing… Wholesome Sweeteners Organic Powdered Sugar only has organic sugar and organic tapioca starch as the ingredients. Hope that helps, we usually buy on Amazon. Thanks for the feedback, April! I guess with some tweaking, it may be possible to make these with coconut oil! They also tasted very coconutty. Maybe using half something else would bring back the sugar taste. You maybe created a coconut sugar cookie then, April! 🙂 You’re right though, doing 1/2 something else might be the answer! This really is a terrific cut out cookie recipe, it tastes just like my mom’s regular cut out cookies. I’m so happy. I didn’t roll the dough with anything other than a counter dusted with rice flour and a rolling pin. The dough isn’t sticky or hard to handle at all so rolling with the plastic wrap really isn’t necessary. This recipe is delicious and perfect! I followed it to a T and had no issues at all aside from trying not to eat them all when they came fresh out of the oven. 😉 My favorite cutout cookie for sure! Absolutely perfect, as advertised! Thank you! So easy to work with (for gluten free!). My kids had a blast making these. And the taste can’t be beat. I personally like the thinner ones, but we tried them at various thicknesses, and all cooked perfectly and tasted fantastic! We used colored sugar on top, but will try with frosting next time. I like that they’re not very sweet, so if you do use sugar or frosting, they won’t be overwhelming. Just curious can you freeze these or is it best to make them fresh? Hi Jen! Absolutely you can freeze them, I do it all the time. I’ve frozen them both iced and un-iced, and it works great either way. Thanks. I am making them for a birthday party and it would be great to do ahead of time! Absolutely! If you ice them first, just be sure to give them time to dry completely, then store them with waxed paper in between the layers. Shouldn’t be a problem. These truly are delicious. I have tried other gluten free cut out sugar cookies, and hands down, they are the best. This will be my go to recipe from now on. Love the new name and site too. This recipe looks great! I am going to try it today. What is the maximum amount of time you can refrigerate the dough for? Hi- Just wondering if I were to eliminate the white rice flour, tapioca starch ,potato starch and xanthin gum, how much cup4cup gluten free flour do you think this recipe would require? it looks like the BEST i’ve found in my search!! Should I just add up the total amount of the flours and substitute? Hi, just wondering if you ever figured out how much gluten free flour to use instead of all of the separate ingredients? I found the separate starches are critical for gluten free baking to have a good consistency. However, I was wondering if using Sweet Sourgham is an option because I prefer to stay away from white rice as this can be a trigger for some gluten intolerant people. You’re welcome to try – but I’m not sure the result would be the same. I wouldn’t do it. I subbed Pamela’s Artisan blend for the flour and starch in equal amounts, and although the cookies looked and tasted good, they turned to sand in my mouth. I recommend following the recipe exactly if possible–they are wonderful. Lemon zest is a nice addition! Thanks for the feedback, Jennifer! I just came across your recipe on Pinterest! I can’t wait to try with my newly diagnosed 6 year old. Just one question…can I use expandex for the tapioca starch is there something else I should use? I’ve never worked with expandex, April, sorry. It’s not readily available to me. I made these twice in the last few days. The first time, I substituted Pamela’s Artisan GF flour blend for all of the flour and starch here. The flavor was great, but the dough was difficult to handle and when I bit into the cookies, they turned to sand in my mouth! Ugh! Then, yesterday, I decided to follow the recipe and they turned out AWESOME! Almost exactly like my old go-to cut-out cookie recipe that I always used at Christmas! The only changes I made were to reduce the sugar to 3/4 C (I don’t like overly sweet things) and I added about a tsp of fresh lemon zest. I sprinkled a tiny bit of red and green colored sugar on top before baking. They are awesome and I will be taking them to a Christmas party this weekend! Thanks so much for bringing back a Christmas memory for me!! Thanks for the feedback, Jennifer, I appreciate it! So glad that you gave them another chance, because this is one of my favourite recipes. Hi! I was wondering if the cookie dough could be refrigerated overnight? Thank you! This recipe looks amazing! Hi Sophia! Yes – the dough can be made the night before, wrapped up tight in plastic wrap, and left in the fridge overnight. You will need to take the dough out about 1/2 hr before you want to use it though, just to let it warm up so that it will roll nicely, because it will get quite hard if left overnight. Hi! I made these last night and my cookies will not hold their shape…any suggestions? The dough was in the fridge several hours before cutting them out and baking them. Please help!! Hi April! After being baked they aren’t holding their shape? Or the dough was difficult to work with before baking? I’ve never had that problem, did you substitute anything? Did you use the xanthan gum? Or possibly roll them too thin? Besides that, I’m at a loss, I’ve never had that issue. Hi! I was wondering if it would work to substitute cane sugar for the granulated sugar? Also, I am about 20grams short on the tapioca starch. Could I top it up with arrowroot? I have no experience with cane sugar, sorry. The extra 20 grams from arrowroot shouldn’t be a problem though. I realize this recipe was posted a few years ago, but I’m new to gluten free baking & was wondering if the rice flour, starches & xanthan gum can be replaced with cup for cup gf flour? Would I use the total of all which is 2 2/3 cups? Thanks! Does the recpie need sweet white rice flour or just white rice flour? I see both mentioned. Thanks! Eager to try it! Where can you buy potato starch?